In any case, I bought many wonderful tools, but the one that’s captured my heart is my immersion blender. Also known as a stick blender, this nifty little machine lets you blend, chop, or whip liquids right in the container they’re already in. What’s the big deal about that, you might ask? Well, it means that with no need to pour things from container to container, it’s considerably easier to make things like pureed soups without pouring boiling chicken stock down your legs. I’d consider that a win. 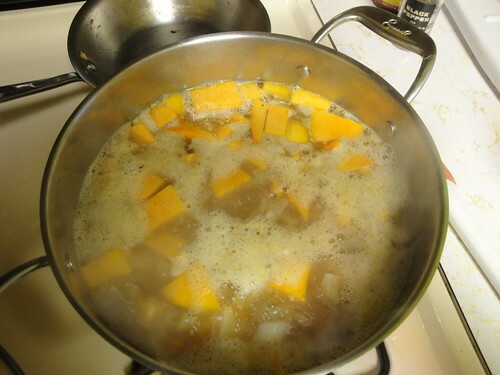 It’s particularly timely because this year I’ve gotten really into making squash soup. I’ve always liked it, but until recently had never found a recipe I really, really loved for home use. One, with apples, was a bit too sweet. Another, thickened with yogurt, was too tangy. They were all pretty good, but they weren’t that Platonic squash soup of my dreams. And then I discovered this. Squash, en route to being soup. It’s six ingredients, if you even count salt and pepper, which I barely do. It’s basically extra-mashed cooked squash. How could this be the ultimate squash soup? I don’t know, but it manages. It might be the homemade chicken stock. It might be the freshly grated nutmeg. It might be that the squash we have right now is really, really excellent. Whatever it is, this soup is GOOD. 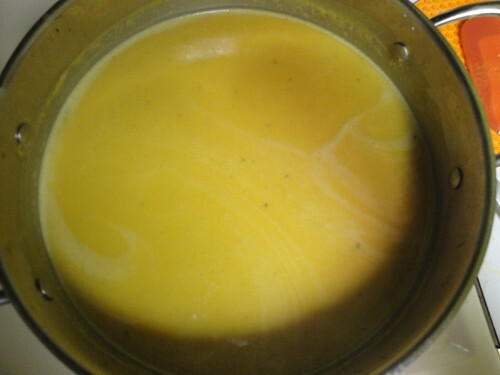 Rich and creamy, sweet and savory, it is everything a squash soup should be. 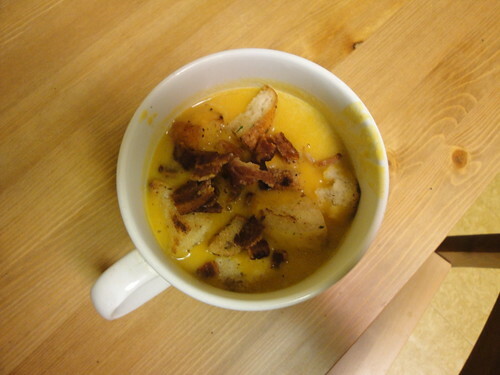 I gussied it up with some bacon and homemade croutons, but it was starting with near perfection, so that was practically gilding the lily. And I owe it all to my magical immersion blender, without which I’d never have gotten the right texture. So easy, and no mess – thanks mom, dad, and Kitchen Outfitters! Asparagus is a fascinating vegetable. Formerly classified as a lily, asparagus is now recognized as its own species – and ranges from the one we’re familiar with, the green (or white, or purple) spears with the tight little leaves, to leafy vines, to covered in thorns. Nutritionally asparagus is a powerhouse, a good source of vitamin B6, calcium, magnesium and zinc, as well as dietary fiber, protein, vitamin A, vitamin C, vitamin E, vitamin K, thiamin, riboflavin, rutin, niacin, folic acid, iron, phosphorus, potassium, copper, manganese and selenium. You know, in case you’re low on your rutin. In the spring, there’s no finer vegetable – while asparagus is now available year round thanks to trucks and planes, its true season here in the North is pretty fleeting. 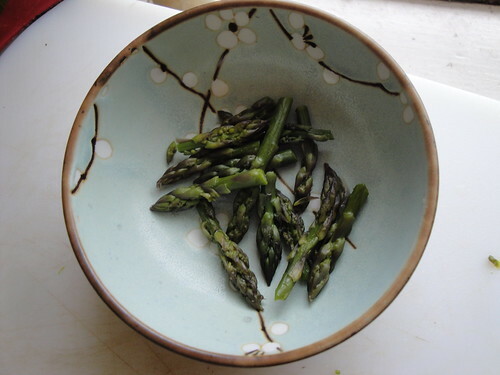 Most people I know steam asparagus – a preparation I enjoy but find a bit dull. This also runs the risk of being unpleasantly mushy if the person steaming isn’t diligent. My preferred preparations are either sauteed with garlic or roasted – this brings out the true sweetness of the vegetable, and the tips get amazingly crunchy and delicate. 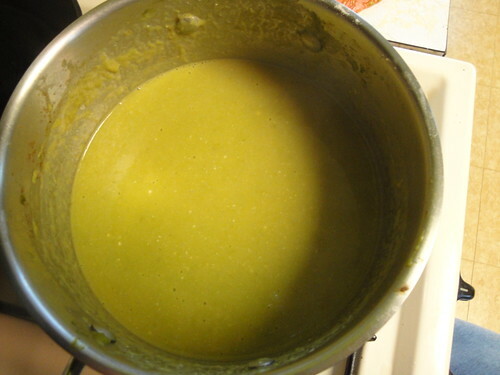 However, I recently found myself in the position of having two big bunches of asparagus and decided to try something new – asparagus soup! 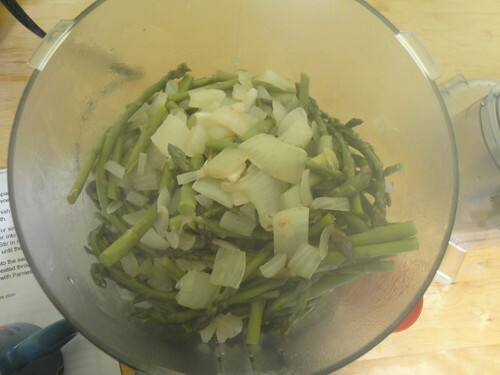 Simmer the asparagus briefly in a bit of stock with some onion. When they’re tender, remove and reserve some of the asparagus tips for garnish later. Try not to steam your fingerprints off. Put the rest of the veggies in the food processor. Now you are trying to avoid steaming your face off! 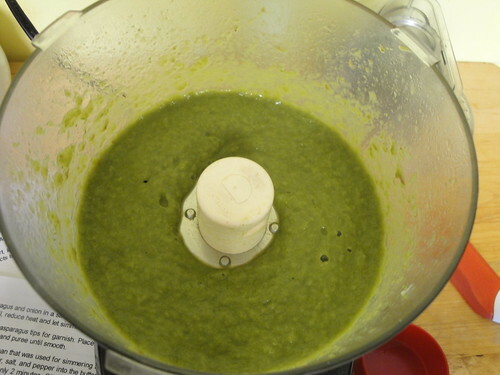 Give them a nice whirl, until you have a pretty much entirely pureed batch of green goop. 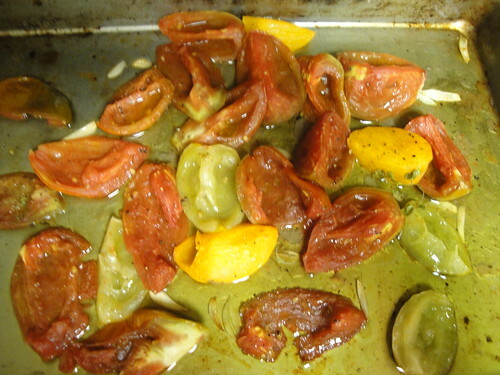 This was another reason to like this recipe – it didn’t have me pureeing with the liquid. If you lack an immersion blender, as I do, this is a relief. Back in the pot it goes! Now you’re going to put in all the lemon and yogurt and milk and stock and whatnot. At first this will look unbearably gross, and then you’ll stir it all up and it will become a pleasant, slightly paler green. When you’re ready to serve it, throw on the tips and some parmesan cheese. If you would like to be extra decadent and have thrown the idea of a vegetarian soup out of the window, why not fry up some lardo and put that on there too? You will not be sorry you did this. 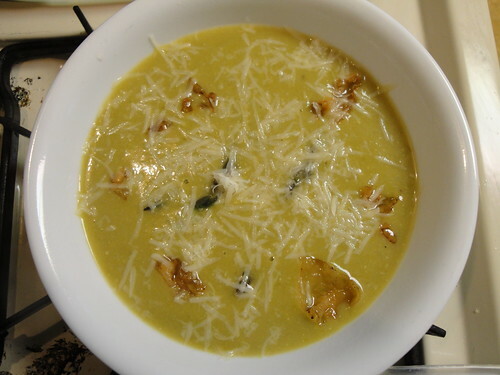 This soup was delicious – creamy and slightly tangy from the yogurt and lemon. And now I have a new, potentially vegan-friendly asparagus recipe in my repertoire! Long-time readers of this blog are very aware of my fondness for all things Brussels sprouts. In particular, I really love the Bittman method of cooking them – slicing them in half, sauteeing in oil and garlic, then roasting until crispy deliciousness is attained. HOWEVER. There are times in a lady’s life when she craves something new, something different. She needs variety – excitement! She doesn’t want to completely discard the good thing she’s got going on, mind you, she just wants to spice things up a bit. At times like these, there’s only one thing to do: get the creative juices flowing and experiment! I pondered the possibilities. Bacon is a traditional pairing for Brussels sprouts, as are nuts. A plan began to form in my brain for the sprouts in my fridge! I’d decided to shred these sprouts, rather than halve them, to allow for quick cooking. Into the food processor they went, whirred into green confetti. While this was going on I was pan-frying a bit of pancetta we had in the freezer, cut into tiny bits that quickly browned into salty perfection. I also grabbed a handful of hazelnuts and roughly chopped them. Into the pancetta pan went the shredded sprouts and the nuts, along with a good portion of olive oil. 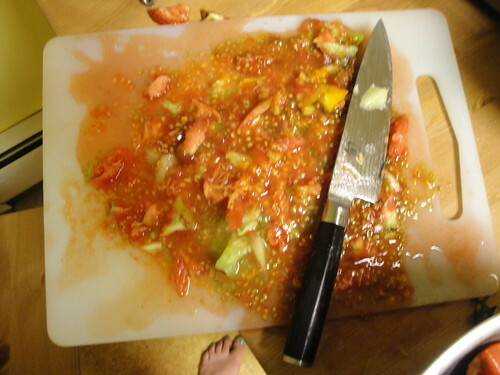 I salted and peppered the whole mess and set about to cooking it, stirring frequently. As the sprouts cooked, they began to soften, but also stick the pan a bit in caramelized hunks. To lift off from the pan, and because I was worried I’d used too many salty, rich flavors, I added a dose of lemon juice. When the sprouts seemed sufficiently tender, I decided they were done. They were, to be perfectly frank, delicious! Tender yet still a bit crisp, with just enough balance between the salty pancetta and the tart lemon juice. The hazelnuts amplified the nuttiness of the sprouts. Even Mr. Menace, who seemed dubious at first, pronounced them very good. 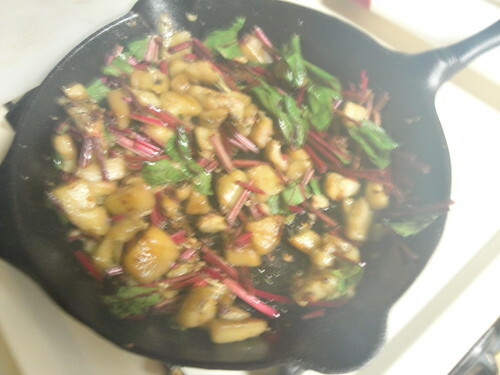 I ended up using them as a platform for some maitake mushrooms I’d sauteed, and it was wonderful. I didn’t quite measure the ingredients, but I have enough of an idea that I’m including a recipe, should you want to experiment yourselves. If you take out the pancetta the entire dish goes from omnivorous delight to vegan – I’d just recommend amping the salt up a bit and perhaps adding a dash more olive oil! Cook the pancetta over medium-high heat until lightly browned. Add the sprouts, hazelnuts, and salt and pepper to taste. Cook for 10 minutes, or until sprouts begin to brown. Add lemon juice and cook an additional 5 minutes or to taste. Enjoy! About a month or so ago, my friend Valerie came to book club with a gift for me – a rather peculiar-looking vegetable. She brought it, she said, in hopes that I would blog about it. Let me start out by saying that this is a really excellent idea, and if any of my other local friends would like to bring me weird produce, I WILL write about it. You may also give me other sorts of weird food – it needn’t be veggies! Sort of like a short, fat cucumber with an attitude, right? A chubby little green mace! They reminded me of a plant we had growing in our backyard when I was a kid that in never learned the name of, except that those were hollow inside, while this was solid. It’s called a maxixe – pronounced, from what I can tell, as ma-sheesh – also known as burr gherkin. They’re related to cucumbers, but more on the order of cousins than siblings, and were first cultivated in India. These days they’re very popular in Brazil, used in dishes like chicken with maxixe and maxixada, a sort of spicy stew typically eaten over rice and beans. Alas, I didn’t have quite enough maxixe to try these recipes, so I figured I’d just wing it. First, I tried it raw, just to see what it was like. I cut off the little spines and sliced it up. As you can see, it was quite seedy inside! 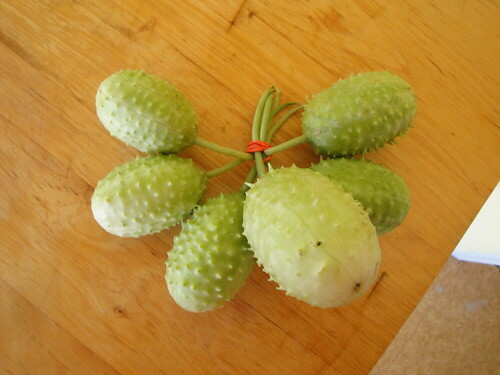 The taste was like a cucumber but more flavorful, with almost a citrusy quality. The seeds were a bit hard but surprisingly tasty – sort of nutty. 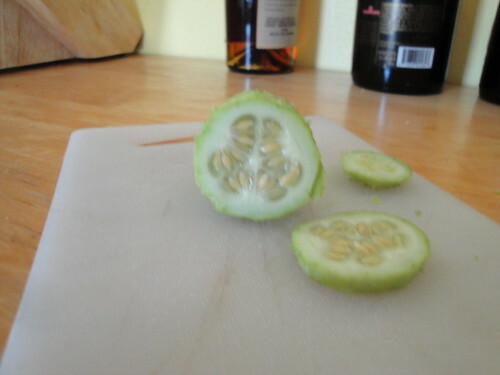 Usually when a cucumber has tough seeds they’re like little slivers of wood, so that was a nice change. Cooked, the maxixe retained some of its lemoniness but not nearly as strongly. It was a perfectly pleasant addition to my stir-fry, but no more compelling than any other similar vegetable. If I had the chance I think I’d like to try one of the traditional Brazilian recipes, just to see how it would fare, but overall, thanks to Valerie for introducing me to a vegetable I’d never met before! Incidentally, maxixe are a great source of zinc and very low calorie – it could be a fun snack if you’re looking for a change from carrot sticks! Late summer in Massachusetts means two important things, vegetable-wise (even though both are technically fruit!) 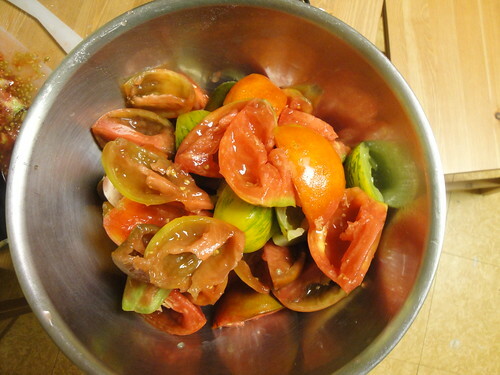 – tomatoes and corn. Both are truly amazing coming from the garden, farmstand, or farmer’s market! 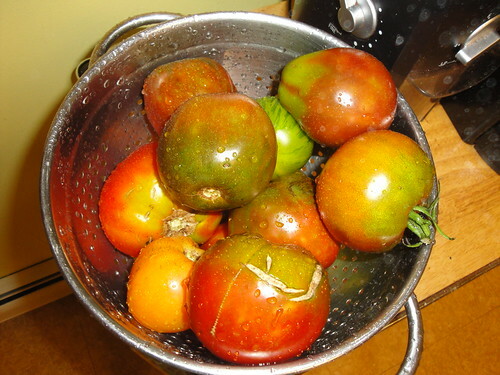 Today I’m focusing on the corn, but look out for a tomato post soon! Corn is one of those vegetables that no one really hates – it’s sweet, if a wee bit bland, and usually used primarily as a vehicle for butter. Unfortunately, because of this it’s gotten a bit of a reputation for being unhealthy. Our associations with are of high fructose corn syrup and canned products soaked in butter and cream, and granted, these are not high on most people’s nutritional check list. But in its native form, corn is high in B vitamins and antioxidants – its no super food, but it can be part of a healthy diet, particularly when eaten as a whole grain, in the form of cornmeal and all of its permutations. It’s still reasonable healthy raw or lightly cooked, providing Vitamin C and those antioxidants, but the Vitamin B takes a bit of work. You see, when Europeans first started growing and consuming what the Native Americans called maize (corn is actually a generic name for grain that somehow stuck to this one in particular! ), they quickly fell ill from malnutrition – in particular, a rather nasty disease called pellagra (don’t click that link if you are squeamish!). Pellagra is caused by a lack of Vitamin B in the diet, which was initially quite the mystery since the Native Americans ate quite a bit of corn and were just fine! As it turned out, the Europeans had missed a crucial step in the way the Native Americans processed the corn – before grinding it up, they soaked it in water filled with ashes or lime – both of which make the water alkali. 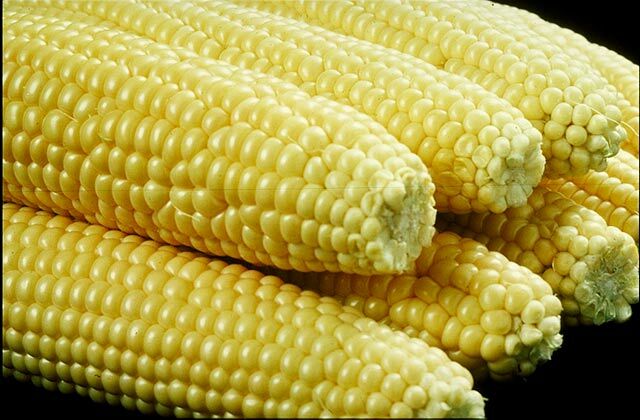 This releases the Vitamin B in the corn, allowing a human to make use of the vitamins when the cornmeal is eaten. The process is known as nixtamalization, and now used, in more high-tech form, whenever corn is made into corn meal. This, along with a somewhat more balanced diet, halted the pellagra, and made corn into a fantastic whole grain to put into your diet! There are many ways to enjoy cornmeal – I make a mean cornbread, if I do say so myself, and I have a to-die-for polenta recipe from Barbara Lynch that I may share with you all another time. But today I want to give you the recipe for one of my very favorite cornmeal dishes, the one that inspired this post. This recipe is extra-fantastic because you can utilize fresh, wonderful farmer’s market corn along with corn meal, for a side dish that is sweet, salty, nutty and cheesy all at once. I give you – arepas! 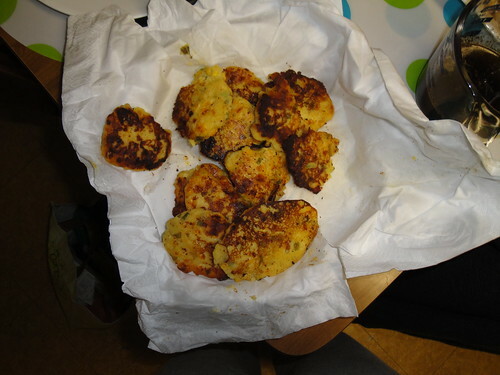 More specifically, these are arepas as interpreted by Mark Bittman as interpreted by me. Are you confused yet? 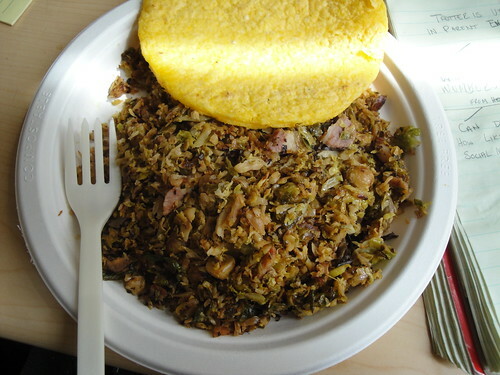 Arepas are a sort of corn cake or bread that are popular in Venezuela and Colombia. They’re sort of like English muffins, if English muffins were made of corn, and are often used in the same way, to make sandwiches or simply toasted. Here’s a link to a recipe for the more traditional Venezuelan arepas. You can see from the picture on that site that they’re fluffier and paler than mine. What Mr. Bittman did is to imagine them with some of the traditional toppings and fillings right inside the pancake. He also uses whole-grain, stone ground corn flour – hence the somewhat coarser texture of these arepas. He works in cheese, and the fresh corn kernels, and jalapenos. Here is his recipe, and if you followed that to a T, you’d be very happy! 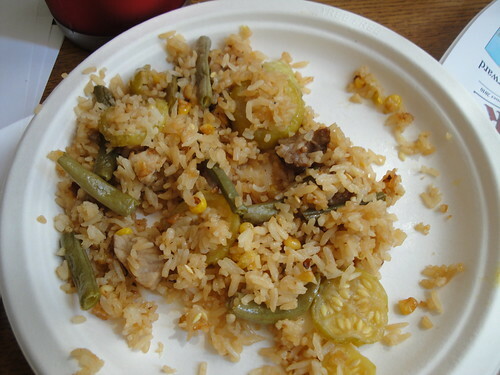 My variations are quite simple – Mr. Menace likes neither jalapenos nor cilantro, so I just leave them out. However, I think your imagination could run wild with these! You could chop up bits of bacon or ham, if meat is your thing, and add them to the batter. If you’re not a meat eater, you could grate in some zucchini, or some chopped tomato (hey, I worked it in here! ), or a bit of garlic. The Vegetable Therapist: Eggs Don’t Grow on Trees! To be fair, neither do eggplants, the subject of today’s post. They grow on delicate, surprisingly tall stems (up to 7 feet, in the wild!) similar to those of their closest cousins, tomatoes and potatoes (they’re all members of Solanaceae the deadly nightshade family! ), but “blank doesn’t grow on stems” doesn’t quite have the same ring, now does it? Known to most of the rest of the English speaking world as aubergine, the eggplant is one of those vegetables that I feel like most people feel strongly about one way or another, mostly because they only eat it prepared one way – battered, fried, and smothered in tomato sauce and cheese. (Clarifying note – this largely applies to folks here in the US. In the Middle East and Mediterranean this is far from the first thing you’d do to an eggplant.) Eggplant Parmesan is very, very tasty, but in addition to the fact that it packs a caloric wallop, I feel like it’s designed to hide the taste of the eggplant entirely. This is a shame, because eggplant is a very tasty vegetable. There’s a slight bitterness to it, but cooked properly this fades away into an enjoyable tang, and you’ve never had another vegetable, not even potatoes, that has the ability to become so creamy with just a bit of cooking. 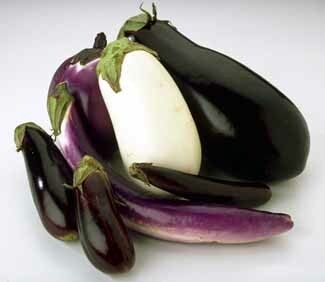 Perhaps this is why the other way I usually see eggplant prepared is in baba ganoush! I recently picked up an eggplant from the Farmer’s Market and knew that I didn’t want to make any of my usual preparations, so I flipped through Bittman’s How to Cook Everything Vegetarian for inspiration. 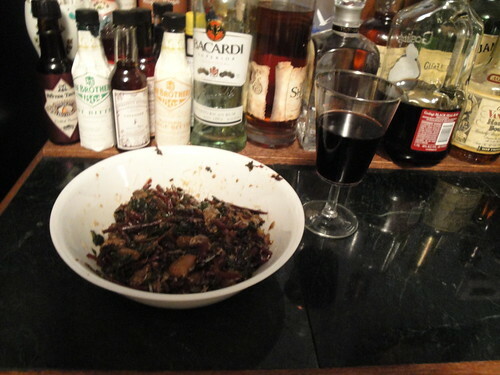 His recipe for sauteed eggplant seemed promising – fast (it was an after work dinner and I was hungry! ), relatively healthy (eggplant is a notorious oil sponge, so sauteeing it requires a fair amount, but Bittman has you cook this until it releases quite a bit back out) and tasty – the recipe promised silky-smooth results. As I pondered what to eat it with, I noticed that one of the variations was for eggplant and greens. Perfect – I’d also bought beets at the Farmer’s Market, and this presented me with the opportunity to use the super-nutritious tops! 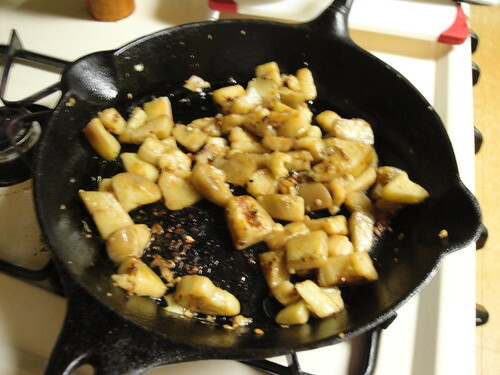 You start by cubing the eggplant and putting it into a pan over medium heat with a 1/3 cup of olive oil and about a tablespoon of minced garlic. Stir constantly for 5-10 minutes until the eggplant starts to release the oil. Cook for another 15 minutes, stirring frequently. 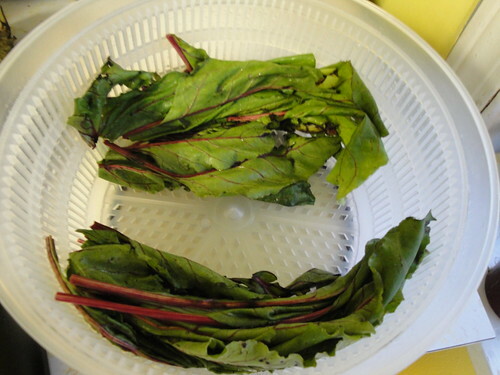 Add the stems of the greens – these need a bit more time to cook. After another 5 minutes, add the greens. Cook another ten minutes or so – if you have more delicate greens, add another 5 minutes to the time before you add them. In the last 5 minutes add a bit more garlic and salt to taste. 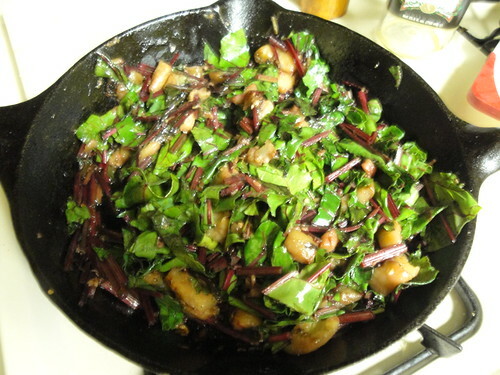 The eggplant was as promised – smooth and creamy and downright sweet, and contrasted beautifully with the still-firm beet greens and their earthiness. The garlic added just enough zip, for me, but you could make it spicier if you like. You can also add a bit of parmesan – without it, this recipe is totally vegan! Do you have any favorite eggplant recipes?